Mary Howard was the daughter of Thomas Howard, 3rd Duke of Norfolk, and Elizabeth Stafford. She was a maid of honor to her cousin, Anne Boleyn. She was present at the baptism on Princes Elizabeth, when she bore the basin, while her half-uncles William and Thomas helped carry the canopy, and the Dowager Duchess of Norfolk carried the infant and served as godmother. Norfolk and Anne were not in good terms, but the value of Elizabeth as a Howard and the ceremonial precedence of the family could not be forgotten. Mary was married to King Henry VIII’s illegitimate son, Henry Fitzroy, Duke of Richmond at Hampton Court, but they never lived together. In fact, King Henry tried to use non-consummation of the marriage as an excuse not to support Mary in her widowhood. By 1540, however, she had been granted a number of former church properties and had an income in excess of £744 per annum. Following Fitzroy's death, Mary lived primarily at Kenninghall when she was not at court and was at the center of a literary circle that included her brother, Henry Howard, Earl of Surrey, and Lady Margaret Douglas. There was talk of a marriage with Thomas Seymour, Queen Jane’s brother, as early as 1538 and the idea was broached again in 1546. The birth of Prince Edward weakened Norfolk's position and left the Seymours entrenched at court despite Queen Jane's death. Norfolk was prepared to make alliance with the upstarts, and so he offered to wed his daughter Mary to Hertford's younger brother Sir Thomas Seymour. Everyone seemed to approve the match. Early in Jun 1538 King Henry consented to the marriage and ordered Thomas Cromwell to do everything necessary to further it. To the surprise of everyone, Mary refused. 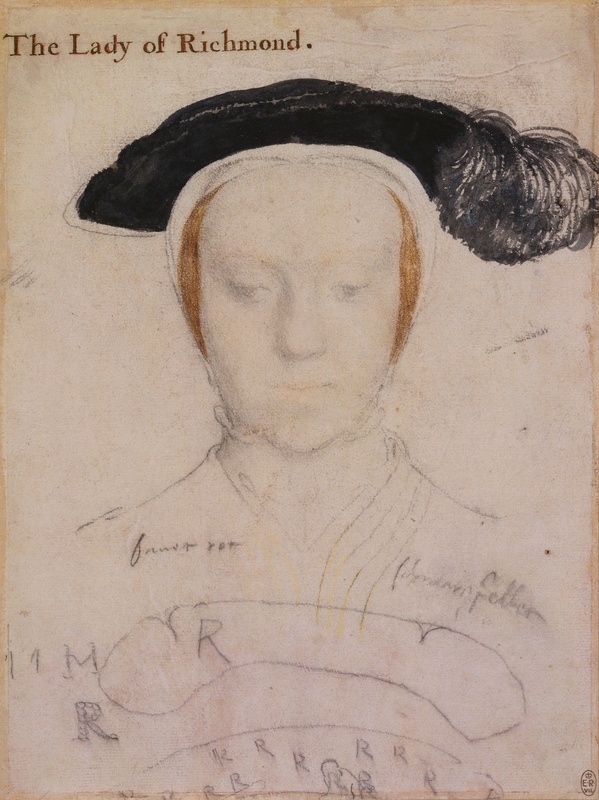 Perhaps Mary was concerned that a new marriage would prevent her from obtaining her dower rights as Fitzroy's widow; although in Jan 1533 Cranmer had confirmed the marriage as lawfully contracted, she had never gained royal confirmation of her claims. Yet the real stumbling block to the match was placed by Mary's brother Henry, Earl of Surrey. Apparently Surrey persuaded his sister to refuse Seymour's hand, for Mary left court in Jul determined not to wed Sir Thomas, and although Norfolk followed her to Kenninghall, he was unable to change her mind. In the fall of 1539 Anne of Cleves arrived in England with an entourage of German maidens. Once in her new country, however, it was expected that she would accept the attentions of English servants. Anne's new household, appointed by the King, awaited her in London. Norfolk did particularly well in the struggle to place family members among Anne's servants. Mary Howard, Duchess of Richmond, was named one of the "Great Ladies", and two other Howard women were among the six maidens attendant upon the queen-to-be. One was Mary Norreys, the Duke's cousin by marriage, and the other was his niece Catherine Howard. Mary was also part of the household of Catherine Howard but send back to Kenninghall in Nov 1541 when the Queen's household was disbanded. In the dangerous days of mid-1546, Norfolk proposed a series of marriages to bind together the Howards and Seymours. Again, Norfolk's daughter Mary, Duchess of Richmond, was to wed Sir Thomas Seymour, and Howard grandchildren were proposed as mates for three of Hertford's offspring. On 10 Jun, Henry gave his approval to the proposal. The main difficulty, as before, was with Norfolk's tempestuous son, Surrey. Surrey was irritated to find that his sister and his children had been espoused without his approval, but the idea of Thomas Seymour marrying into the family was the greatest insult to his dignity. Mary Howard had balked at wedding Seymour earlier, but now seemed willing to go through with the marriage. Determined to prevent a disgrace to the family, Surrey confronted Mary in an anteroom at court and berated her for even considering the match, cruelly suggesting that, if Mary wanted power, she ought to follow the French example by becoming the King's mistress rather than Seymour's wife. In Dec 1546, when Mary’s father and brother were arrested on charges of treason. Sir Richard Southwell was sent to Kenninghall with two other informers to tell Lady Surrey and the Duchess of Richmond of Surrey's and Norfolk's arrest, and to collect further evidence. As soon as Southwell and his companions arrived they placed men at all the doors and sent for the Duchess of Richmond and Bess Holland, 'who were only just risen', Southwell reported, ‘but came to us without delay in the dining-chamber'. When she heard their errand, the Duchess fainted. Revived, she fell on her knees and said, 'Though I love my father, and my brother — whom I note to be a rash man — I will conceal nothing. I will declare in writing all I can remember against them'. 'Use truth and frankness, and do not despair’ Southwell told her. Her statements were too doubtful to add anything to the formal indictment. The fate of Norfolk's personal property is even better documented, for the inventories drawn up at the time of his arrest were annotated as goods were sold or given away. Somerset took his pick of the 200 horses, 88 oxen, 115 steers, 420 hogs and 407 sheep found at Kenninghall. The Duchess of Richmond and the Countess of Surrey divided what remained of the household goods after Somerset was sated. After Surrey was executed, Mary was given charge of his children. She established a household at Reigate and employed John Foxe to educate them at Reigate Castle, probably on Lord Wentworth's advice. They were joined there by Charles Howard, their cousin, two years older than Thomas, son of Lord William Howard of Effingham. Edward VI knew 'no better place for their virtuous education' than with their aunt. At Christmas 1551 the Duchess of Richmond was granted an annuity of £100 towards their maintenance, and the next year was given a further £100. Bess Holland, Norfolk’s mistress, received an annuity of £20 from Mary Howard, Duchess of Richmond. As early as Feb 1547 Norfolk began to be allowed family visitors; Mary, Duchess of Richmond, and Elizabeth, Duchess of Norfolk, were permitted to visit Howard "at tymes and with traynes convenient, the Lieutenant being present". Unlike most of the rest of the Howards, Mary adoped the New Religion, which meant she fell out of favor when Queen Mary came to the throne. She did remain close to her father, however, and when he died he left her £500. Mary Howard died on Monday 9 Dec 1557. The Countess of Surrey acted as chief mourner at the funeral of her sister-in-law. A great procession wound its way through the streets of Norwich to the cathedral: the dean and canons of Norwich, the mayor and aldermen of the city, the chief officers of the Duke's household with white staves, Garter King of Arms and the heralds following the great Howard banner, and after the coffin the Countess, with her daughter Catherine bearing her train. The service over, the heralds rode with the small burial party to Framlingham, but Dowager Countess Frances returned with the mourners to the duke's palace for the funeral feast; but for the rashness of Surrey ten years back it would have been her palace. As chief mourner she sat in the hall under a cloth of estate of black velvet. Thus she discharged her debt to the woman who for five difficult years had acted as foster-mother to her own children. Mary, Duchess of Richmond and Somerset, was buried with her husband in St. Michael's church, Framlingham, Suffolk, but their tomb was left unfinished at the Duke of Norfolk's death and has no effigies.